We are so excited to announce our latest Mom of the Month - Sally Belter! Sally started attending Stroller Strides in Glen Ellyn in October of 2015 with her daughter Ellie. No matter what is going on in her life - Sally always has a smile on. She is welcoming and friendly to all of the moms in classes. She truly lights up a room! Recently Sally joined our Lombard Body Back session. She gives 110% at her workouts and has goals of being a healthy example for her daughter. We're so glad you found us Sally! 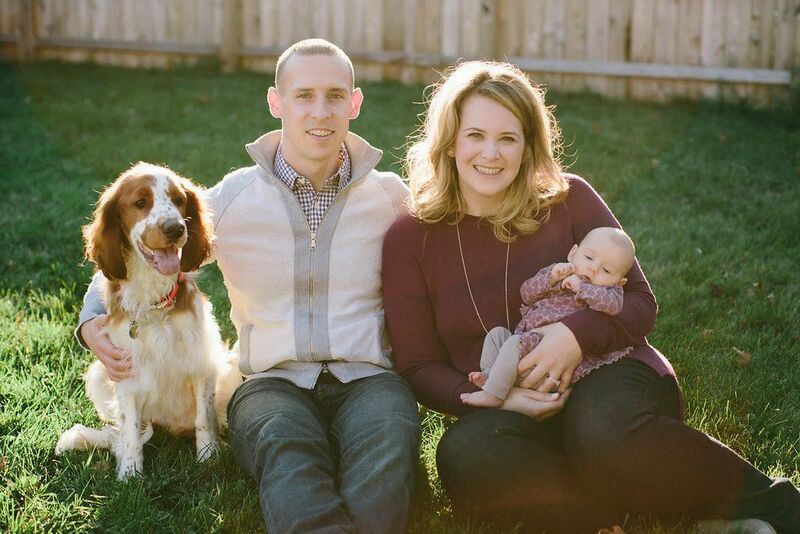 Tell us about who is in your family: My husband Matt and I welcomed our daughter Ellie last August. We can't believe she is already seven months old! We also have a two-year-old Welsh Springer Spaniel named Otto. Current/Previous career: I am a high school Spanish teacher. (I am on maternity leave this school year.) Prior to being a mom, I was also an assistant girls' swim coach at my school. What does motherhood mean to you: The greatest blessing of my life. What is the furthest you have been away from home: I studied abroad in Granada, Spain for a semester in college. I lived with a Spanish family and totally fell in love with Spain, its people, and its culture. While I was there, I was able to do a lot of traveling around Europe and took a weekend trip to Morocco, as well. How did you find FIT4MOM? I remember having seen something about F4M on Facebook when I was pregnant and thought it looked interesting. Then, when my daughter was six weeks old and I was starting to itch to get out of the house and socialize, I saw Stroller Strides advertised in the Glen Ellyn Park District brochure. I am so beyond grateful to have found it. How has FIT4MOM changed your life? Not only did F4M give me the opportunity to get out of the house and interact with people who weren't an infant or a dog, it connected me with a group of amazing, supportive, kind, generous, thoughtful, non-judgmental, down-to-earth women who just happened to know EXACTLY what I was going through as a new mom. To have them to listen to me vent, answer my questions, offer their perspective, commiserate about a sleepless night, celebrate our kids' milestones and so much more has been such a gift. And to have all of that AND be able to get in great workouts and model a healthy lifestyle for my daughter? Incredible. Proudest moment: Holding Ellie for the first time. Tell us something about yourself that would surprise us: I LOVE Broadway musicals. Like, LOVE them. I look forward to the Tony Awards the way most people look forward to the Super Bowl.